Contact form 7 issued an update requiring everyone to update their recaptcha to version three. 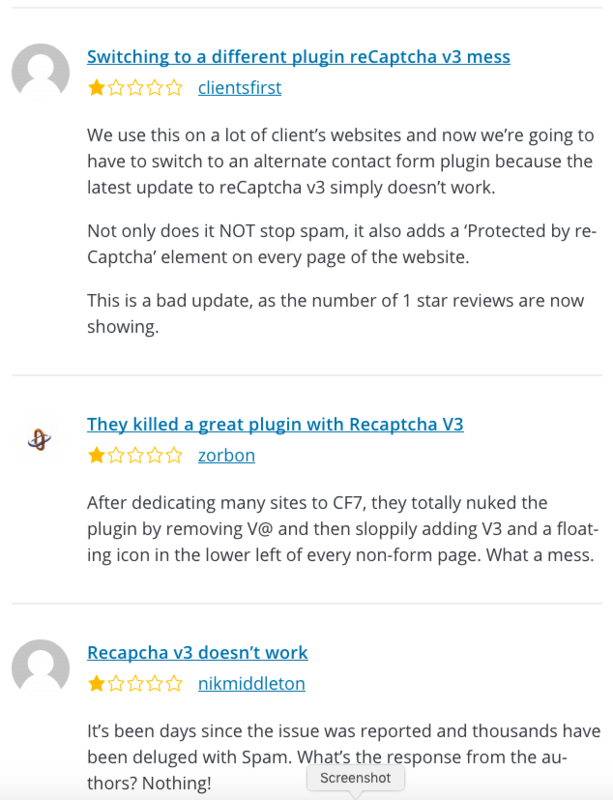 Normally Cf7 works beautifully for catching spam, even with recaptcha v2, however this recent update seems to have sent their plugin in reverse. It’s not hard to roll back until they give a fix, but since everyone forced to delete v2 keys and recreate sites in recaptcha it would mean doing the same to grab new v2 keys. If you have a lot of sites, this is obviously a hassle. Also, not only does the captcha not work, users are reporting a v3 icon appearing on every page and not just the contact form page. Seems like a sloppy update. Maybe they can add v2 to the latest plugin so we have the option until it’s fixed? I think the best option may be to revert to v2, what do you think? There are two quick fixes if you want to go to v2. Version 5.0.5 is the one you want. Go back to Google ReCAPTCHA delete your Version 3 key (if you obtained one) and get your Version 2 site key and secret key. Back on your site, go to the Settings of the new plugin and add those keys. If anyone else has any quick fixes, let us know! Hopefully we get a quick update within the next day or so!